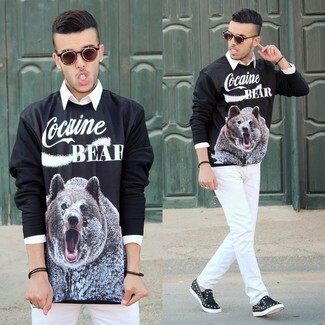 If you're on the lookout for a casual yet sharp outfit, try pairing a black print crew-neck sweater with Maison Martin Margiela white jeans. As well as very comfortable, these items look great together. For shoes, choose a pair of black embellished leather low top sneakers. 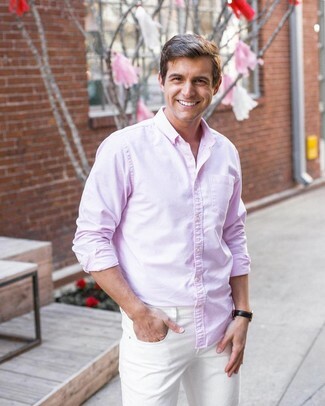 A pink long sleeve shirt and Maison Martin Margiela white jeans worn together are a match made in heaven for those dressers who prefer casually dapper combinations. 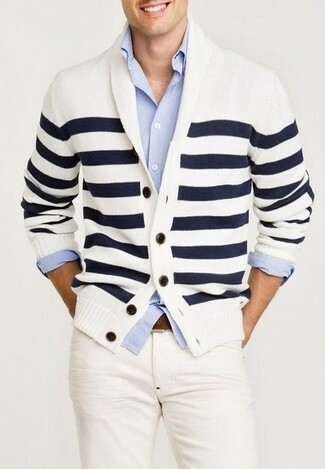 If you're on a mission for a casual yet stylish outfit, go for a white and navy horizontal striped shawl cardigan and Maison Martin Margiela Slim Dean Jeans White from Neiman Marcus. As well as super comfortable, these items look wonderful together. 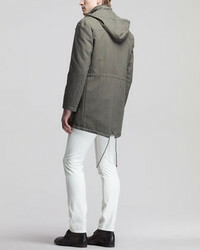 If you're on a mission for a casual yet seriously stylish getup, try teaming a khaki field jacket with Maison Martin Margiela Slim Dean Jeans White from Neiman Marcus. Both of these garments are totally comfortable and will look great when worn together. A pair of dark brown suede driving shoes will seamlessly integrate within a variety of combos. 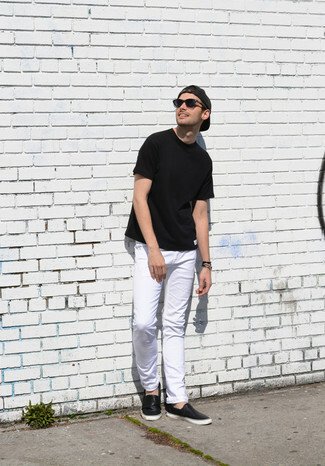 We're all outfiting for comfort when it comes to dressing up, and this combination of a white and black floral crew-neck t-shirt and Maison Martin Margiela slim dean jeans white from Neiman Marcus is a great illustration of that. Sporting a pair of tobacco suede desert boots is a simple way to add extra flair to your getup. Contrary to what you might believe, ensembleing seriously stylish doesn't require that much effort. 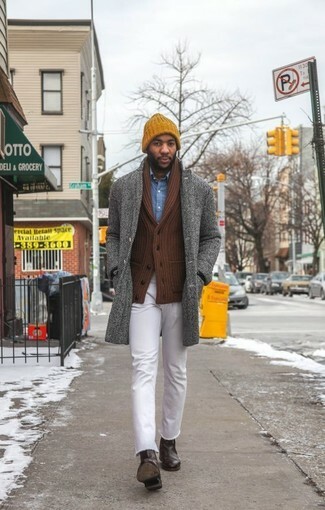 Just consider pairing a grey herringbone overcoat with white jeans and you'll look great. Make dark brown leather chelsea boots your footwear choice to take things up a notch. If you're on the lookout for a casual yet dapper ensemble, reach for a light blue crew-neck t-shirt and white jeans. Both garments are totally comfortable and will look great together. If you're searching for a casual yet dapper outfit, make a light violet long sleeve shirt and Maison Martin Margiela Slim Dean Jeans White your outfit choice. As well as super comfy, both of these pieces look amazing when worn together. And if you want to instantly bump up the style of your look with one piece, add dark brown suede loafers to the mix. If you're searching for a casual yet dapper ensemble, opt for a black crew-neck t-shirt and Maison Martin Margiela Slim Dean Jeans White. As well as super comfortable, both garments look great paired together. Take a classic approach with the footwear and grab a pair of black leather slip-on sneakers.